Wednesdays: 10-12 o'clock, advance announcement by office required. Katharina Morik is full professor for computer science at the TU Dortmund University, Germany. She earned her Ph.D. (1981) at the University of Hamburg and her habilitation (1988) at the TU Berlin. Starting with natural language processing, her interest moved to machine learning ranging from inductive logic programming to statistical learning, then to the analysis of very large data collections, high-dimensional data, and resource awareness. She is a member of the National Academy of Science and Engineering and the North-Rhine-Westphalia Academy of Science and Art. She is the author of more than 200 papers in well acknowledged conferences and journals. Her latest results include spatio-temporal random fields and integer Markov random fields, both allowing for complex graphical models under resource constraints. Her aim to share scientific results strongly supports open source developments. For instance, the first efficient implementation of the support vector machine, SVM_light,, was developed at her lab by Thorsten Joachims. Also the leading data mining platform RapidMiner started out at her lab, which continues to contribute to it. Currently, the Java streams framework is developed, which abstracts processes on distributed data streams. Since 2011, she is leading the collaborative research center SFB876 on resource-aware data analysis, an interdisciplinary center comprising 14 projects, 20 professors, and about 50 Ph D students or Postdocs. She was one of those starting the IEEE International Conference on Data Mining together with Xindong Wu, and was chairing the program of this conference in 2004. She was the program chair of the European Conference on Machine Learning (ECML) in 1989 and one of the program chairs of ECML PKDD 2008. She is in the editorial boards of the international journals “Knowledge and Information Systems” and “Data Mining and Knowledge Discovery”. Jörg Lässig, Kristian Kersting, Katharina Morik, Computational Sustainability. Studies in Computational Intelligence, Volume 645 2016, Springer, ISBN: 9783319318561, 2016. Morik/97b Morik, Katharina. Operationale Beschreibungen des Lernens. In F. Rapp (editors), Die konstruierte Welt -- Theorie als Erzeugungsprinzip, pages 115--129, Projekt Verlag, 1997. Morik/97c Morik, Katharina. Knowledge Discovery in Databases -- An Inductive Logic Programming Approach. In Freksa, Jantzen and Valk (editors), Foundations of Computer Science -- Theory, Cognition, Applications, pages 429--436, Springer, 1997. Morik/Brockhausen/97a Morik, Katharina and Brockhausen, Peter. A Multistrategy Approach to Relational Knowledge Discovery in Databases. In Machine Learning Journal, Vol. 27, No. 3, pages 287--312, Kluwer, 1997. Morik/etal/97a Morik, Katharina and Pigeot, Iris and Robers, Ursula. The Use of Inductive Logic Programming for the Development of the Statistical Software Tool CORA. In Workshop Logische Programmierung, M"unchen, 1997. Brockhausen/Morik/96a Brockhausen, Peter and Morik, Katharina. Direct Access of an ILP Algorithm to a Database Management System. 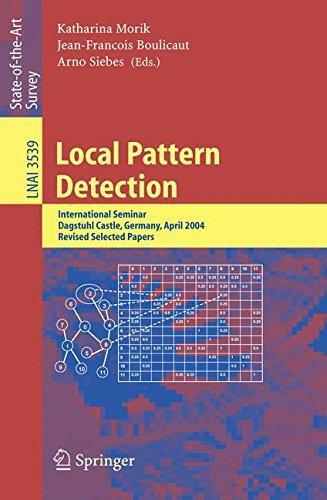 In Pfaringer, Bernhard and Furnkranz, Johannes (editors), Data Mining with Inductive Logic Programming (ILP for KDD), pages 95--110, Bari, Italy, 1996. Morik/Brockhausen/96a Morik, Katharina and Brockhausen, Peter. A Multistrategy Approach to Relational Knowledge Discovery in Databases. 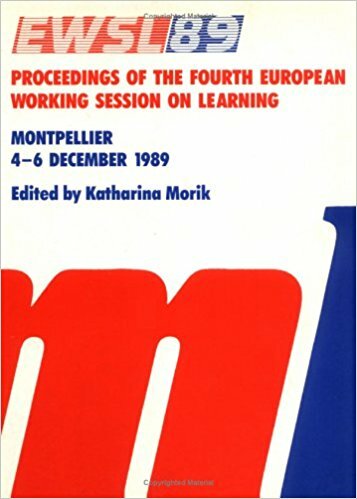 In Michalski, Ryszard S. and Wnek, Janusz (editors), Proceedings of the Third International Workshop on Multistrategy Learning (MSL-96), pages 17--27, Palo Alto, AAAI Press, 1996. Morik/Vosniadou/95a Morik, Katharina. A Developmental Case Study on Sequential Learning: The Day-Night Cycle. In Peter Reimann and Hans Spada (editors), Learning in Humans and Machines - Towards an Interdisciplinary Learning Science, pages 212 -- 227, Elsevier, 1996. Lindner/Morik/95a Lindner, Guido and Morik, Katharina. Coupling a Relational Learning Algorithm with a Database System. 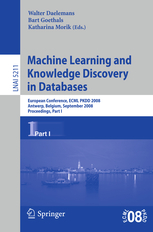 In Kodratoff and Nakhaeizadek and Taylor (editors), Statistics, Machine Learning, and Knowledge Discovery in Databases, pages 163 - 168, MLnet, 1995. Morik/95a Morik, Katharina. Maschinelles Lernen. In Gorz, Gunther (editors), Einführung in die Künstliche Intelligenz, pages 243-297, Bonn, Germany, Addison-Wesley, 1995. Morik/Lindner/95a Morik, Katharina and Lindner, Guido. Coupling a Relational Learning Algorithm with a Database System. In Yves Kodratoff and Gholemreza Nakhaeizadeh and Charles Taylor (editors), Statistics, Machine Learning and Knowledge Discovery in Databases, Crete, Greece, ML--Net Familiarization Workshop, 1995. Kietz/Morik/94a Kietz, J\"org-Uwe and Morik,Katharina. A Polynomial Approach to the Constructive Induction of Structural Knowledge. In Machine Learning Journal, Vol. 14, No. 2, pages 193--217, GMD (German Natl. Research Center for Computer Science), 1994. Morik/94a Morik, Katharina. Balanced Cooperative Modeling. 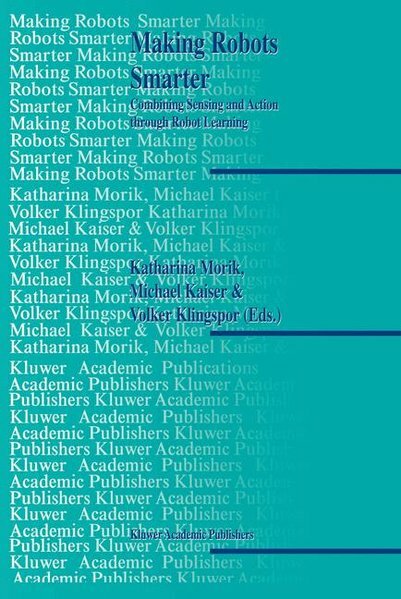 In Ryszard Michalski and Gheorghe Tecuci (editors), Machine Learning -- A Multistrategy Approach, Vol. 4, pages 295--318, Morgan Kaufmann, 1994. Sommer/etal/94a Sommer,Edgar and Morik, Katharina and Andre, Jean-Michel and Uszinsky, Marc. What Online Machine Learning Can Do For Knowledge Acquisition - A Case Study. In Knowledge Acquisition, Vol. 6, No. 4, pages 435 -- 460, 1994. Morik/93a Morik, Katharina. Balanced Cooperative Modeling. In Machine Learning, Vol. 11, pages 217--235, 1993. Morik/93b Morik, Katharina. Maschinelles Lernen. In Gunther Gorz (editors), Einfuhrung in die Kunstliche Intelligenz, Addison Wesley, 1993. Morik/93d Morik, Katharina. Overview of Logic-based Learning in Germany. In 8. Deutsch-Japanisches Forum Informationstechnologie, 1993. Morik/etal/93a Morik, Katharina and Wrobel, S. and Kietz, Jörg-Uwe and Emde, W.. Knowledge Acquisition and Machine Learning - Theory, Methods, and Applications. London, Academic Press, 1993. Morik/92a Morik, Katharina. Applications of Machine Learning. In Thomas Wetter and Klaus-Dieter Althoff and John Boose and Brian Gaines (editors), Current Developments in Knowledge Acquisition - EKAW92, Vol. 599, pages 9--13, Springer, 1992. Kietz/Morik/91a Kietz, Jörg-Uwe and Morik, Katharina. Constructive Induction of Background Knowledge. In Proceedings of the Workshop W8 at the 12th IJCAI--91: Evaluating and Changing Representations in Machine Learning, 1991. Morik/91b Morik, Katharina. Underlying Assumptions of Knowledge Acquisition and Machine Learning. In Knowledge Acquisition, Vol. 3, pages 137--156, 1991. Morik/91d Morik, Katharina. Machine Learning Toolbox. In KI - Künstliche Intelligenz, Vol. 5, No. 1, pages 34--36, 1991. Morik/91f Morik, Katharina. Maschinelles Lernen in Deutschland. In KI - Künstliche Intelligenz, Vol. 5, No. 1, pages 32--34, 1991. Morik/etal/91a Morik, Katharina and others. A Common Knowledge Representation Integrating Learning Tools. In Proc. of the 1st International Workshop on Multistrategy Learning, Harpers Ferry, 1991. Morik/90b Morik, Katharina. Integrating manual and automatic knowledge acquisition -- BLIP. In Readings in Knowledge Acquisition: Current Practices and Trends, pages 213--232, New York [u.a. ], Horwood, 1990. Emde/Morik/89a Emde, Werner and Morik, Katharina. Consultation-independent learning in BLIP. In Kodratoff, Yves and Hutchinson, Alan (editors), Machine and Human Learning, pages 93--104, East Wittering, England, Michael Horwood Publ., 1989. Morik/89a Morik, Katharina. Integration Issues in Knowledge Acquisition Systems. In ACM Sigart Newsletter, Vol. 108, pages 124--131, 1989. Morik/89c Morik, Katharina. Sloppy Modeling. 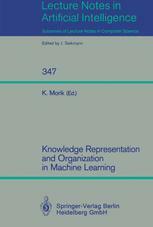 In Morik, Katharina (editors), Knowledge Representation and Organization in Machine Learning, pages 107--134, Berlin, New York, Springer, 1989. Morik/88a Morik, Katharina. Acquiring Domain Models. In John Boose and Brian Gaines (editors), Knowledge Acquisition Tools for Expert Systems, Academic Press, 1988. Morik/87b Morik, Katharina. User Models and Conversational Settings -- Modelling the User's Wants. In Wahlster, W. and Kobsa, A. (editors), User Models in Dialog Systems, pages 364--385, Springer, 1987. Morik/87d Morik, Katharina. Acquiring Domain Models. In Intern. Journal of Man Machine Studies, Vol. 26, pages 93--104, 1987. Hoeppner/etal/84a Hoeppner, Wolfgang and Morik, Katharina and Marburger, Heinz. Talking it Over: The Natural Language Dialog System HAM-ANS. 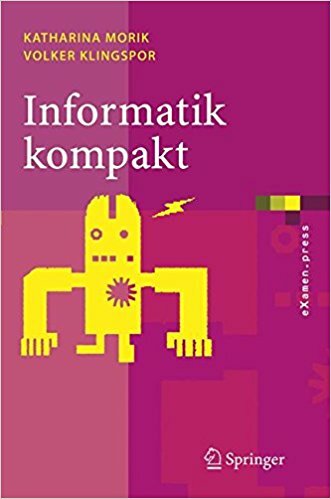 In Cooperative Interfaces to Information Systems, pages 189--258, Springer, 1986. Morik/86a Morik, Katharina. Acquiring Domain Models. In International Journal of Man-Machine Studies, 1986. Busemann/etal/85a Busemann, Stephan and Hoeppner, W. and Marburger, H. and Morik, K.. Representing and Processing Copula and Full-Verb Sentences in HAM-ANS. In GWAI-85. German Workshop on Artificial Intelligence, 1985. Morik/85a Morik, Katharina. Ansätze der sprachorientierten KI-Forschung. In LDV-Forum, No. 2, 1985. Morik/85b Morik, Katharina. Partnermodellierung in Beratungsdialogen. In Sprachverarbeitung in Information und Dokumentation 10. Jahrestagung der Gesellschaft fur Linguistische Datenverarbeitung, 1985. Morik/85c Morik, Katharina. User Modelling, Dialog Structure, and Dialog Strategy in HAM-ANS. In Procs. of 2nd EACL, 1985. Morik/Rollinger/85a Morik, Katharina and Rollinger, Claus-Rainer. The Real Estate Agent - Modeling Users by Uncertain Reasoning. In The AI Magazine, pages 44--52, 1985. Morik/84a Morik, Katharina. Partnermodellierung und Interessenprofile bei Dialogsystemen der Künstlichen Intelligenz. In Claus--Rainer Rollinger (editors), Probleme des (Text)-Verstehens. Ansatze der Künstlichen Intelligenz, pages 249--264, 1984. Morik/84b Morik, Katharina. Customers' Requirements for Natural Language Systems: Results of an Inquiry. In International Journal of Man Machine Studies, 1984. Hoeppner/etal/83a Hoeppner, Wolfgang and Morik, Katharina. Das Dialogsystem HAM-ANS: Worauf basiert es, wie funktioniert es und wem antwortet es?. In Linguistische Berichte, No. 88, 1983. Hoeppner/etal/83b Hoeppner, Wolfgang and Christaller, Thomas and Marburger, Heinz and Morik, Katharina and Nebel, Bernhard and O'Leary, Mike and Wahlster, Wolfgang. Beyond Domain-Independence: Experience with the Development of a German Language Access System to Highly Diverse Background Systems. In Procs. of the 8th IJCAI, 1983. Morik/83a Morik, Katharina. Demand and Requirements for Natural Language Systems -- Results of an Inquiry. In Proceedings of the 8th International Joint Conference on Artificial Intelligence (IJCAI), 1983. Morik/Rollinger/83a Morik, Katharina and Rollinger, Claus-Rainer. Partnermodellierung im Evidenzraum. In GWAI-83. 7th German Workshop on Artificial Intelligence, 1983. Christaller/etal/82a Christaller,Thomas and von Hahn, W. and Hoeppner, W. and Marburger, H. and Morik, K.. Wissensbasierter natürlichsprachlicher Zugang zu unterschiedlichen Diskursbereichen mit dem KI-System HAM-ANS. In R. Slama (editors), Workshop Sprachverarbeitung, Gesellschaft für Mathematik und Datenverarbeitung, Bonn, Addison-Wesley, 1982. Morik/82a Morik, Katharina. Überzeugungssysteme der Künstlichen Intelligenz. Validierung vor dem Hintergrund linguistischer Theorien über implizite Ausserungen. Tübingen, Max Niemeyer, 1982. Morik/81b Morik, Katharina. Verarbeitung von externer und interner Situation in Überzeugungssystemen. 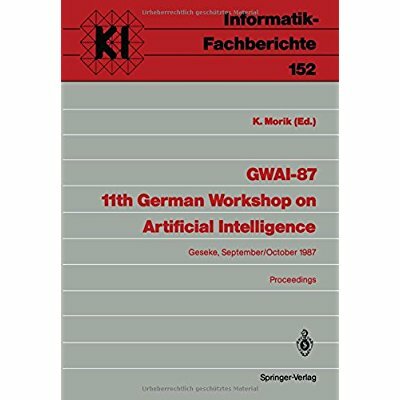 In Siekmann, Jörg H. (editors), German Workshop on Artificial Intelligence GWAI--81, No. 47, pages 287--296, Berlin u.a., Springer, 1981.